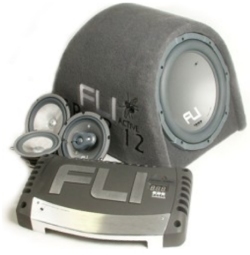 FLI The new concept of affordable car audio brought to you by people who are tired and frustrated with the endless stream of crap audio products that never live up to their claims. Such products are often poorly designed, manufactured and in most cases simply re-branded and re-badged. So you’ll agree it's time for something a little more serious! FLI are proud to announce a brand new addition to our fantastic range of head units. The FLI DVD 9 is a feature packed head AV head unit features a 3 inch, high quality screen, DVD and MP3 playback as well as offering 3 pre outs and an auxiliary input for expanding your system. Click here to find out more.